Wolper Jewish Hospital has acknowledged Rabbi Mendel Kastel OAM on 30 years of visiting patients and providing pastoral care at the Hospital. 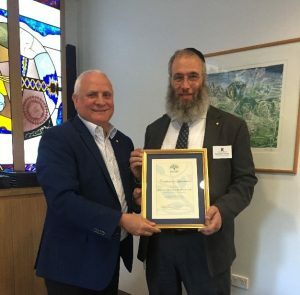 In his presentation to the Rabbi at the Wolper Annual General Meeting, Daniel Goulburn OAM – President of Wolper Jewish Hospital, paid tribute to Rabbi Kastel. “The care and compassion you provide when interacting with our patients greatly enhances the outstanding health care that Wolper provides. We are deeply appreciative of your voluntary service providing spiritual guidance to any of our patients whenever it is required,” he said. Mr Goulburn also acknowledged the incredible work Jewish House does in providing crisis intervention and prevention services. A donation was made by Wolper Jewish Hospital to Jewish House in honour of this important milestone.